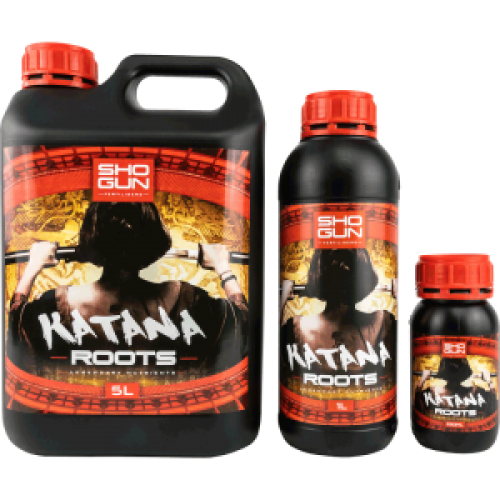 Giving your roots the cutting edge required for explosive growth, SHOGUN Katana Roots stimulates massive root growth and a strong and healthy root zone. All great plants need a strong foundation and the expertly formulated combination of ingredients in Katana Roots help to create the most efficient uptake mechanism your plants could ever wish for resulting in massively increased performance and ultimately better yields. Highly concentrated formula - used @ only 0.2ml per litre! Cuttings & Seedlings – Add at a rate of 5mL/L of nutrient solution. Soak propagation plugs in the solution for 15 minutes. Water this solution into your propagation plugs once per week until your plants are ready to plant on. Root Feed – Add at a rate of 0.2mL/L to your nutrinet reservoir or watering can. Use throughout vegetative growth and for the first three weeks of the flowering cycle.